With St. Patrick’s Day coming up this Sunday, we started to wonder if there were any St. Patty’s recipes or crafts we could call shenanigans on. Of course you can always go crazy with food coloring and make green cookies, green cupcakes, etc. but we were looking for something more involved. 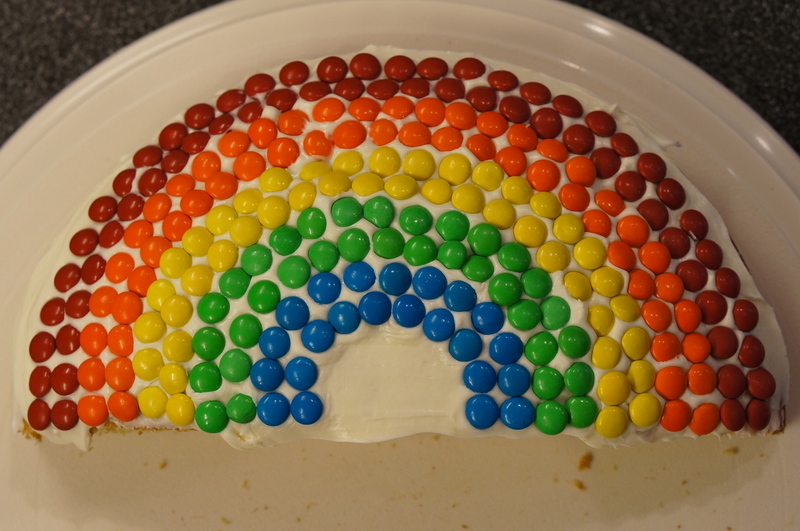 Then we found this little gem: a rainbow cake!! 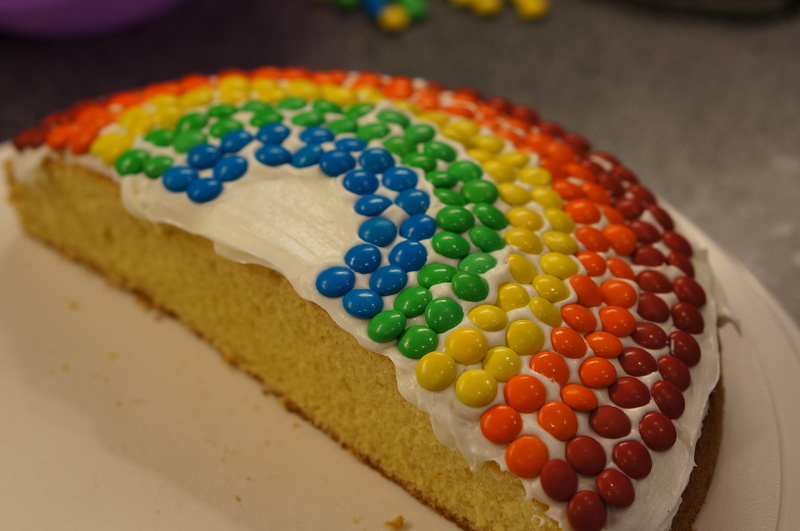 The original pin used colored fondant to make a rainbow on a sideways cake! We didn’t want to go through all the hassle of working with fondant, so we put on our thinking caps and figured out a way to alter this cake into an easier recipe. Then it came to us- we could use M&Ms! Here’s how our St Patrick’s Day cake turned out compared to the original. First we gathered our ingredients. 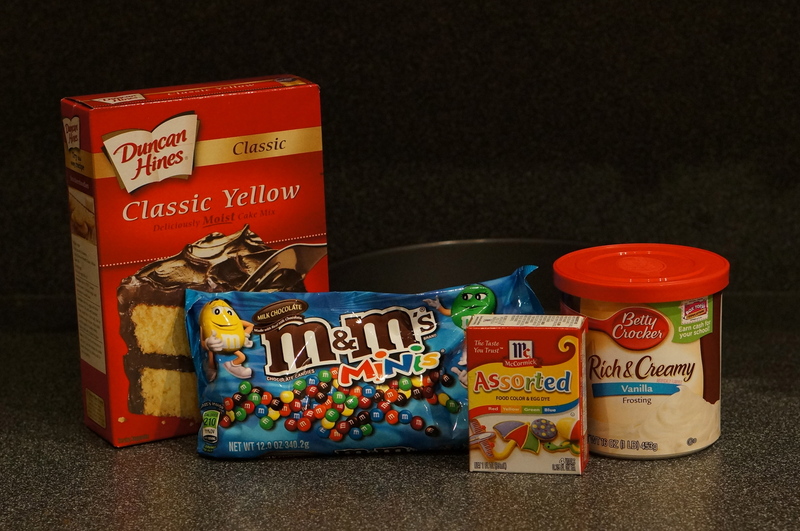 You’ll need a box of cake mix, white icing, mini M&Ms and some food coloring. Bake the cake according to the package direction in a circle pan. We actually only used half the cake mix because we wanted to use the rest for other shenanigans (get excited! ), but you can certainly use the whole thing! Your cake will just be thicker than ours. 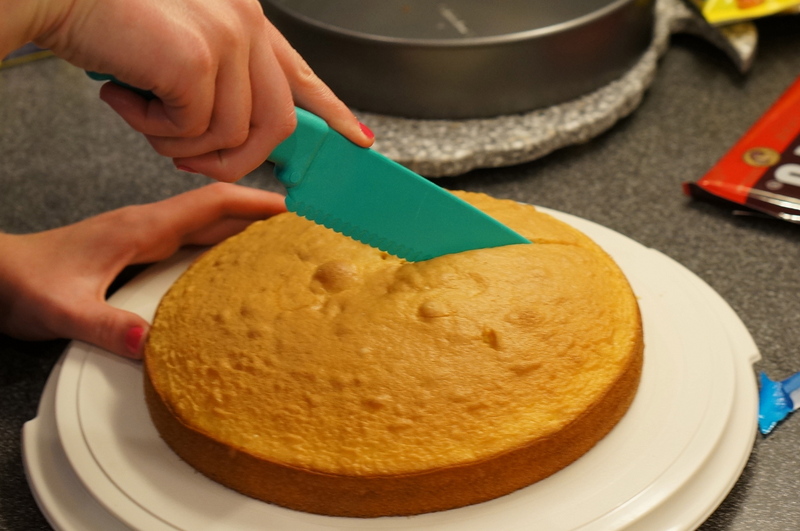 After the cake is cool, cut each circle in half. Ice the top of one of the half-circles of the cake with white icing. Now you’ll start the rainbow! 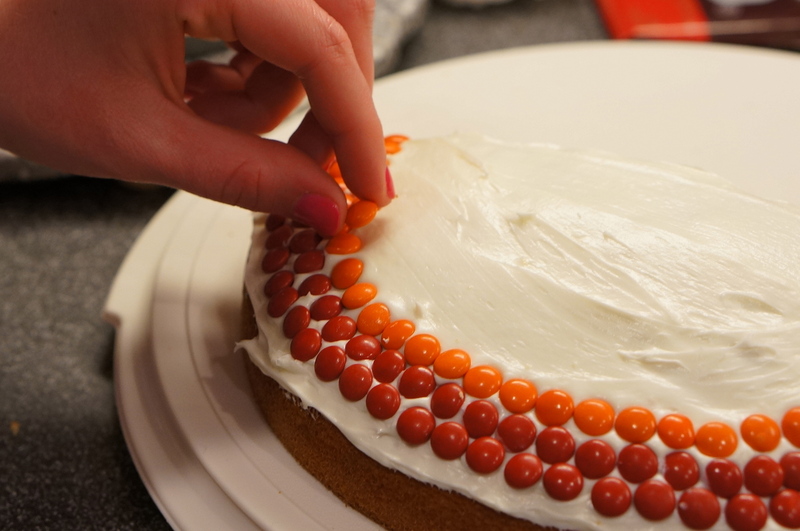 Starting from the outer rim of the cake, we put two rows of each color M&M until our rainbow was complete. 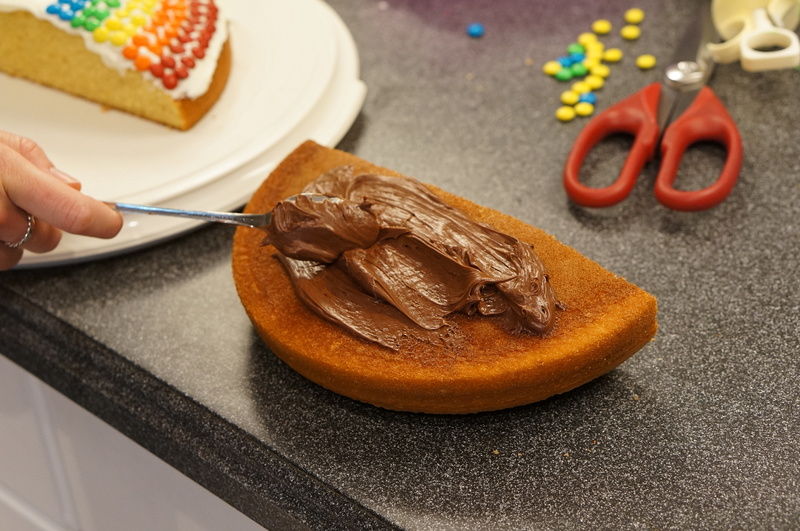 This was actually the most annoying part of making the cake because we wanted to flip all the M&Ms so that the Ms weren’t showing. 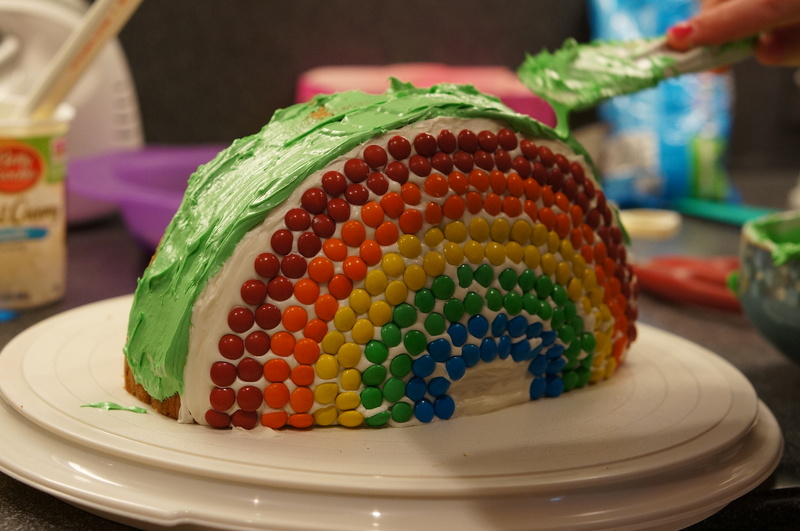 Although we stuck with traditional rainbow order, you could definitely get creative. Next we dyed some of the white icing green (you know how we love being festive). Stand the cake up on its side and ice the curve of the cake with the green icing. 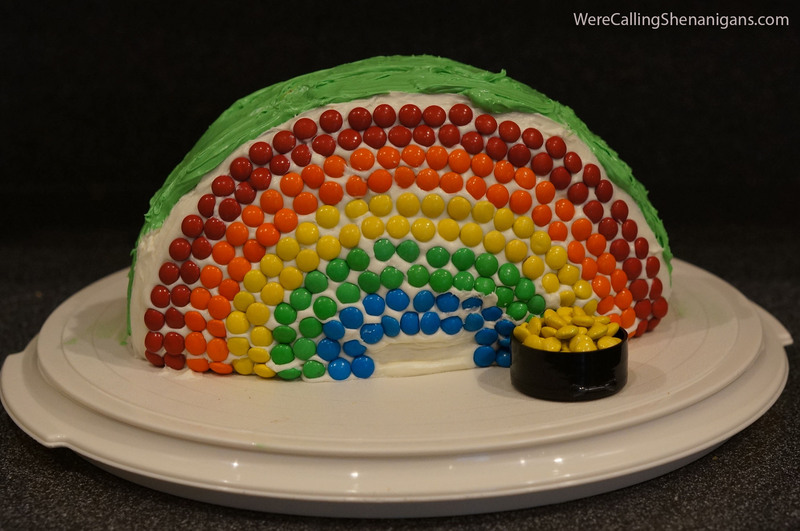 So we revoke shenanigans on this festive St. Paddy’s Day cake (at least on our m&m version). If you try our version or the original Pinterest recipe, please let us know how it turns out! That is a great way to have little ones help with sorting the colors and work on counting! Colorful fun for any age! Love it! That’s such a good point! It’s a perfect St. Patricks day craft for kids. For sure! That is so cute, love the cookies!